McConnell Research Enterprises P/L (MRE) design and manufacture the Maxi-Steam range of customised, hot water extraction cleaning equipment. From Truck-mount mobile units to fixed plant Mass-Transit Cleaning Systems. MRE also provide a range of Tools, Ancillary Equipment and Chemicals, enabling operators to give their clients the best possible quality of service. 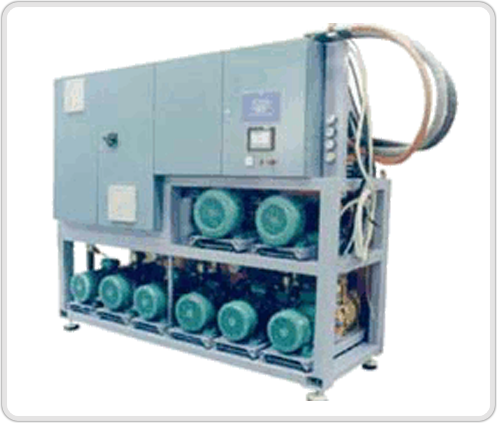 MRE also provides comprehensive in-house Service, Repair and Testing of all Maxi-Steam equipment, as well as Hypro™ and Hydra-cell™ High Pressure Pumps and (Dairy style) Liquid Ring Vacuum Pumps. 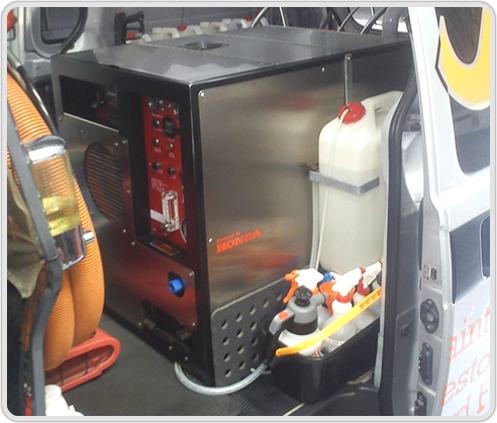 Maxi-Steam units use petrol fuelled, air-cooled, GX690(27Hp) Honda engines. The engine and the liquid-ring vacuum pump are mounted on an internal “cradle” frame that is then fitted via anti-vibration mounts inside a fully galvanised outer frame. The outer frame has stainless steel noise suppressing panels affixed to each face and includes a folding lid/access panel. These can be easily removed for access to internal components for repair and service. The unit also comes sporting a fully instrumented dashboard panel, which gives operators instant feedback about the units running status as well as vacuum and water temperature and pressure levels. most effective and efficient way. The waste and optional pump-out tanks are of all stainless steel construction and can be easily and thoroughly cleaned between jobs (recommended) to stop the growth of dangerous bacteria and other biological hazards, and since waste water is ejected, via 15 metre hose, to a suitable point such as a sewer or other grey/black water waste point (30+ metres with the optional pump-out system installed), there is no need to store waste water on-board. Competing products utilise problematic pump-out systems or require waste water to be carried on-board which can lead to dangerously contaminated waste tanks that cannot be cleaned properly as they contain surge baffles, and additionally may require the operator to obtain a special license(s) to carry and discharge this waste to a prescribed depot/point. The Maxi-Steam unit generates its own hot water using a patented heat exchange system that provides continuous hot water at around 70-80 degrees Centigrade (80 deg. maximum, under normal cleaning conditions – temperatures at-the-tool cannot be inferred, promised or quoted due to ambient temperature and total length of hose used) and uses a proven Hypro high pressure plunger pump to generate adjustable pressure from around 50 PSI to well over 1000 PSI (approaching 2000 PSI). This enables the operator to go from cleaning upholstery inside, walk outside, change tools, adjust the water pressure and then clean concrete/tiling in literally 1 minute. This, coupled with a range of tools and accessories, allows operators to realise higher productivity for their initial outlay and lower ongoing overheads. These units do twice the job of any portable machine and are straightforward, easy to use. Mounting cleaning units such as these in vehicles requires a relatively high degree of waterproofing across the entire floor of the vehicle. A proven method is to have the floor of the vehicle sealed with fibreglass over a high-density plywood base, running the fibreglass up the side walls to at least 100mm high. Another option is to use a high density vinyl type flooring surface in place of fibreglass however the fibreglass is many more times resilient, will last the lifetime of the vehicle and will greatly mitigate any corrosion issues that may affect the floor of the vehicle. Each Maxi-Steam unit is fully tested and checked before delivery and is covered by a conditional 12 month warranty and the Honda engine is covered by its own 2 year warranty - all other components are covered by their applicable warranties. Discuss your exact requirements with us for a competitive, realistic, Value For Money price. Important facts and positives for choosing a Maxi-Steam unit. Each Maxi-Steam unit is Australian made and is the result of over 25 years of continuous Research and Development by the most qualified personnel in the industry. Weight and Footprint – about ~360Kgs, 900 long x 690 wide x 830 high -machine only. Vacuum Level – Up to 24”Hg, nearly twice that of competing imported brands. Noise Level – Using sound attenuation panels -very quiet operation, early start / late finish. Hygiene – The waste tank can be thoroughly cleaned after each job. Filtration – Standard filtration to 350micron. Pump-Out – Optional pump-out system to safely discharge waste water up to 50m from unit. Cost effective Servicing – Service can be completed in 1.5hrs, and consumables (oil, filter & spark plugs) generally totalling less than $50.00 per service. Basic servicing can be done by yourself or local mechanic or anybody with basic mechanical skills. Any Honda dealer can provide engine-only service. Plenty of space to spare in most medium to long wheelbase vehicles to allow storage of other equipment such as portable equipment and dryers etc. The equipment can be used as a heavy duty dry vacuum, for normal hot water extraction cleaning, for tile and hard surface cleaning, graffiti removal and other hard-clean type work, as well as flood extraction and restoration work. Most importantly – MRE build the machines, MRE have the parts readily available, MRE have the knowledge to upkeep and repair the equipment – Importers Do Not. The Maxi-Steam unit is an uncomplicated and unpretentious machine, constructed from the best quality products available in its class. A well designed system that does the job it claims without any bells, whistles or shiny baubles. A system that will give you confidence to get the job done, big or small, efficiently and quickly, without the need for the many and complicated controls and multiple connections usually associated with most imported equipment. 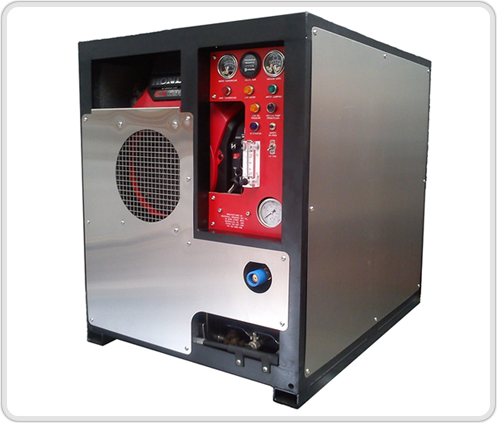 The Maxi-Steam unit is completely self contained and does not require you to obtain costly permits to legally transport and discharge waste water, or carry a fresh water supply, or carry any on-board generators or dangerous gas hot water equipment. MRE provides a range of tools and accessories to give operators to ability to do more than just clean carpet and upholstery. 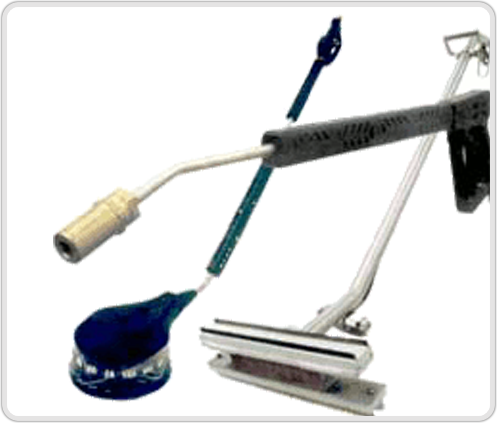 MRE's in-house designed cleaning tools and related accessories are hand made locally and designed for long life (typically around about 10 years), easy service and can actually be repaired, unlike most competing tools. MRE also supplies high pressure rotary tools for hard surface cleaning, from the small hand spinner all the way up to the biggest 750mm wide tool - and they all have vacuum recovery ports. These rotary tools are supplied by Mosmatic and are Swiss designed and made, and are the very best quality tools of their type we know of, typically giving very long life even with regular use. As well as these, MRE has other miscellaneous accessories - just enquire to see what we have available. Chemicals such as G.R.O.G (std. & Green), SK50, Sonifresh, Rust Remover, Soniquat, Sonizyme, SK85, Chemox and Odorblok are available from MRE (in 5 litre or 20 litre containers), supplied by Sampson Chemicals-Sonitron - a leader in cleaning chemicals for all sorts of applications. We only keep a limited range of their quality products in stock that are applicable to most operators needs, but anything that SC-Sonitron produces can be quickly and specially ordered in. We also still provide our “Maxi-Cleaner” branded general carpet detergent, proven over time to be one of the best general detergents (in 20 or 200 litre containers). 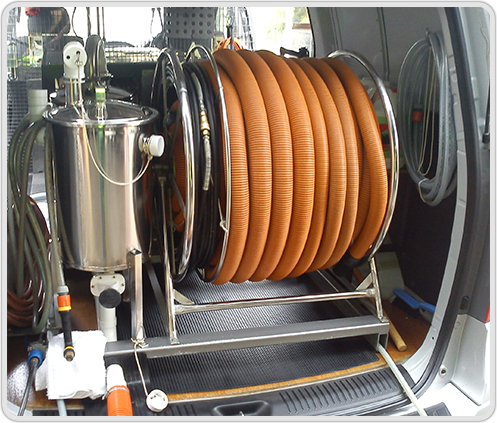 Maxi-Steam Mass Transit Cleaning Systems are an extension of the basis of the truck mount system. They are an integrated, single-system installation that provides operators with the ability to complete internal, and some external, cleaning duties of railcars (or any other large scale vehicle, such as trams and buses) in the most efficient manner possible. Cleaning operations that can be achieved using these systems include; extraction cleaning of soft and hard flooring or other applicable surfaces, extraction cleaning of upholsteries, brush assisted cleaning of external surfaces and pressure cleaning of external surfaces. The system can also be used for cleaning most surfaces in and around the work area outside of the vehicle itself, keeping the workplace clean and safe for everyone. provide the most efficient use of time and energy in regards to operators ability to reach cleaning areas without having to reconnect to a different outlet to continue working, and are also located for the best OH&S outlook. The main plant itself is is a fully contained system, requiring only power, water, waste water and air-discharge connections for it to be operable. The system incorporates it’s own water heater that provides water to the system at a maximum of 80 degrees centigrade and there is a hot water recirculation loop built into the ducted system that ensures that hot water in the system does not cool, providing continuous hot water to all the outlet connections (due to variations, including system ducting requirements, specific temperatures at-the-tool cannot be promised or quoted). The plant also has it’s own solids waste tank that contains easy to handle waste filter bags that can be cleaned between uses. The Maxi-Steam Mass Transit Cleaning Systems come with a 12 month limited warranty (does not include any item(s) deemed to be consumable), and all components are covered by their applicable warranties as well. McConnell Research Enterprises (MRE), design, manufacture, supply, install and service truck mounted and fixed plant, High Pressure Hot Water Injection – Vacuum Extraction systems, within Australia and internationally. The Company was founded in 1980 by Peter McConnell and later in 1985 his brother John McConnell joined him. They saw a need in the Domestic carpet cleaning market for real cleaning equipment and created the first Maxi-Steam prototype truck mount. It quickly found acclaim with its patented Heat Exchange system and revolutionary use of a liquid-ring vacuum pump. These helped the Maxi-Steam unit deliver higher vacuum than the competing machines of the day, and with steady, constant hot water at the tool for more effective cleaning than any other machine on the market - this still holds true today. By using quality tried and tested components, designing the units and their implementation in-house and by building each unit by hand from the ground up, each Maxi-Steam unit will deliver a long and productive life with value for money over the long term. Maxi-Steam truck mount units started life as a Briggs & Stratton powered unit in 1981. Since then MRE has used Kawasaki, Kubota (petrol and Diesel) and now use the highly reliable Honda powered units. The Honda series of Maxi-Steams began with the 20 Hp(Horsepower) unit with a smaller vacuum pump, soon followed by the 24Hp unit that boasted the same larger vacuum pump that the previous generation Kubota-P600 units enjoyed. MRE now offer the latest Maxi-Steam unit with a 27Hp engine that delivers more power overhead for higher vacuum loads and higher water pressure with reduced load on the engine, giving better return for outlay and longer engine life over time. In early 2013 Peter and John both decided to retire from the business and long-time employee David Jones purchased the company, to continue providing the industry with the best possible products and service for many years to come. McConnell Research Enterprises P/L (MRE) design and manufacture the Maxi-Steam range of customised, hot water extraction cleaning equipment. From truck-mounted Mobile Units to dedicated Mass-Transit Cleaning Systems. MRE also provide a range of Tools, Ancillary Equipment and Chemicals to allow users to give their customers the best possible quality of service.